Review 5 super stars !!! Such a beautifully illustrated book. Bright and vibrant, easily read and put forth. Pages are lush and well defined, drawings easily understandable and a good story line that keeps the child interested till the end. 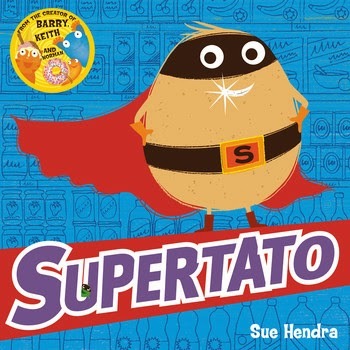 Supertato has an eye catching cover, lovely and bold and included within the pages, a meaning at the end of the story ** Everyone has special talents ** . Which I found great. Funny and Enjoyable even my 8 year old loved it. Sue Hendra has a talent for wonderfully created characters, and a crafty illustrator. You can find Sue at her website - www.worldofsudehendra.com for activities, book info and games.